To paraphrase a line from one of childhood’s greatest movies: “I want it all, and I want it now!” Veruca Salt, Willy Wonka and the Chocolate Factory. Such is the battle cry of the data generation. A generation that grew up in the digital age. They’ve never experienced the pain of dial-up internet, never hunted for a working phone booth, never missed their favorite show because they had to work late. They expect high speed, no disruptions and everything at their fingertips; they want it all, and they want it now. But even this tech-savvy generation hasn’t experienced the evolution that is fast approaching; an evolution which will touch every generation. The time of unprecedented global connection across digital devices is almost upon us. The question is, as industry leaders, are we ready? Sure, we’ve dipped our toes into the connected world, with Wi-Fi-enabled devices like speakers, smartwatches and phones, but are we prepared to jump into the deep end of global convergence and, equally important, how will we monetize it? With the rollout of 5G and the dawn of the internet of things in sight, now is the time to prepare. Industry analysts agree that the connected world of sensors and smart devices that comprise IoT will fundamentally change the way we live and work and do business. What will it take to monetize IoT? What action is needed now to ensure a strong position at the forefront of this growing market? How will we deal with the tsunami of data that is about to swamp us? It’s a new business model for many companies (consumer goods, device component, etc.) that have never had to address onboarding, management and monetization of a true service ecosystem. Plus, industries that were once siloed, such as healthcare, entertainment and transportation, will soon be connected, creating additional value for consumers and businesses. Change is certainly required, but it’s not as easy as putting new technologies in place; it must start at the very root of how we serve today’s digitally connected consumer. TM Forum expects that everything that can be monitored will be, that sensors will be so cheap every home will have them. The industry seems to agree; research firm McKinsey predicts the IoT market will grow into a $4 to $11 trillion industry by 2025. 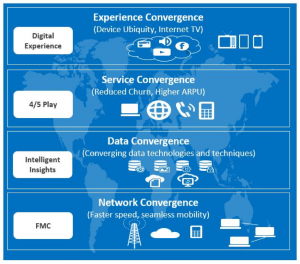 Experience convergence: Network, data and service convergence for automatic connection of multiple devices, allowing seamless experiences anywhere, anytime and across any device service. Service convergence: An ecosystem of connected services that allow ‘n-play services that create stickiness, reduce churn and drive higher ARPU. Data convergence: Convergence of data and techniques to collect and analyze data to create enhanced experiences, enrich interactive features and make proactive recommendations. Network convergence: Merging of fixed, mobile and other connected technologies to create a reliable core with broad coverage, super speeds and lower access costs. To thrive in this new world, convergence must first happen at the business-model level. New multidimensional business models will include an increasingly complex web of partners as well as a back-end infrastructure that can onboard, manage, monetize and settle among those partners to better serve the end user, whether a consumer or an enterprise. Moving support platforms to the cloud will provide greater speed and scalability to mobilize the partner ecosystem and reduce operational costs, but it’s only the first step. Utilizing data to enhance every area of our lives from entertainment to healthcare ushers in a new opportunity for microservices. This new way of designing software applications, independently deployable to the cloud, facilitates scalability, adaptability and speed, and is ideal for supporting a wide range of platforms and devices including web, mobile, IoT and wearables. Businesses will need to adopt this new methodology if they are to keep up with the consumers’ ever-growing appetite for more dynamic experiences across a broader range of devices. Just as convergence is evolving the human experience, industry must evolve and adapt to take advantage of this exciting development. Enterprises must rethink everything from their underlying support systems to how they connect with consumers. They must find a way to give customers everything they want, when they want it, without disruption. But equally as important, they must put technologies in place today to turn their investment into revenue tomorrow.